Today is jeans for charity day at work, which I love. Style articles these days tout jeans for work, but in my workplace it's still not technically permitted on the regular, although many show up every day in torn and faded jeans and think they are acceptable for work. They are not. My co-worker and I showed up wearing kind of the same outfit - beige infinity scarf, blush top, black jeans and black heels. She is almost 50 and I am 31 and we both look great haha. 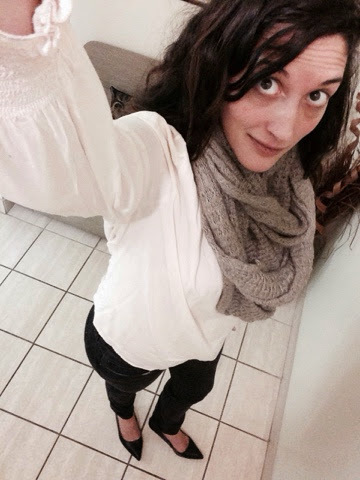 Scarf by the Bay, blouse by Gap (sentimental because I wore it when pregnant on my Montreal babymoon, I wear a lot of my mat clothes still, am I the only one? ), jeans by Guess, heels at Target (I keep selling these, they are so cheap, a perfect pump, and Target is closing in Canada so get yours before they are gone!! I scored the last two pairs in my size yesterday).